To conclude Refugee Week 2017, Lord Alfred Dubs will introduce the premiere screening of ‘Calais children: A case to answer’ at Garden Court Chambers. After the screening, join us for a discussion of the film and the government's response to the refugee crisis and the High Court cases which from next week begin the challenge to the government on reneging on its commitment to accept vulnerable refugee children under the ‘Dubs Amendment’. As the Calais jungle was set to be razed in October 2016, there were over 1,900 unaccompanied minors stranded there - many of whom had a legal case to enter the UK. Director Sue Clayton alongside others worked to raise the profile of these children and get their cases heard. With the camp in flames, the French President asked the UK to take some responsibility, as Calais is the UK’s official border. Theresa May refused. What happened next is a shameful indictment of the UK’s human rights record, as the UK government delayed action; lied about the conditions the young people suffered over the following months in France; failed to properly assess their cases; and repeatedly tried to change the terms of the Dubs Amendment - legislation specifically designed to protect vulnerable minors like these. 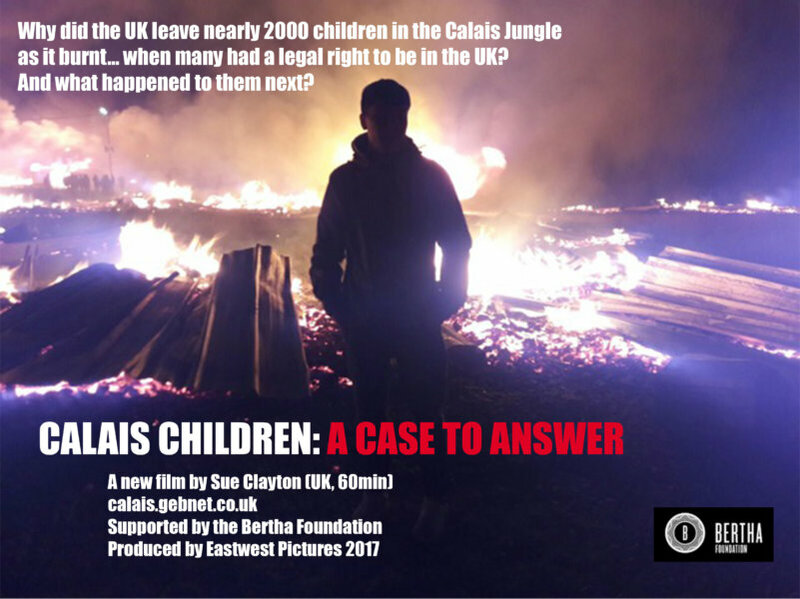 CALAIS CHILDREN: A CASE TO ANSWER follows the young people over the months since they left the Jungle. In telling the story of the Calais children, the film raises concerns about the remaining 85,000 minors in Europe. And questions if our Government’s cynical policy towards them is what we, the UK people, want to see done in our name. Join us at Garden Court Chambers for the premiere screening, where we will speak to Lord Dubs and the volunteer groups and lawyers who are challenging the Home Office in the High Court. Please note this is a private view by invitation only. If you are interested in attending, please request a place using the booking form below. You can read more about the film, and contribute to its completion funding, at www.calais.gebnet.co.uk.